Huge Padres fan here. I was wondering if you had any idea why the Cardinals have their city name (St. Louis) on their home uniforms, and their team name (Cardinals) on their road unis? I don’t recall this ever being done by other teams. Interesting question, as I too have never seen this done before. Turns out there is only one real change being made to the Cards iconic uniforms, and that is the addition of the alternate jersey which does have “St. Louis” on the chest. These are actually replicas of hte Cards 1932 uniforms, which is the last year that they had the name of the city on their uniforms. 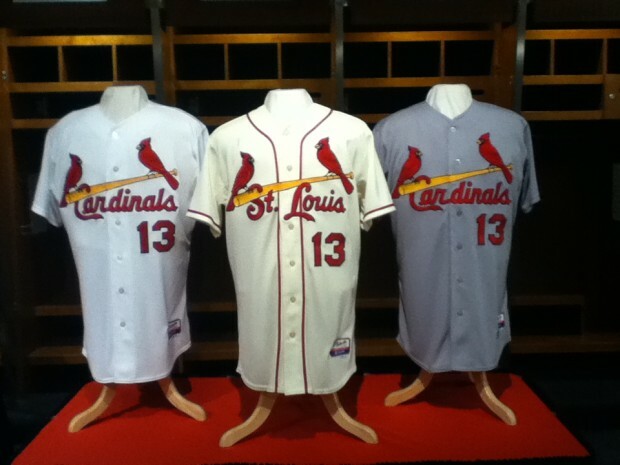 For the past 80 years all of the uniform jerseys both home and road had “Cardinals” on them. When asked about it, their president, Bill Dewitt III commented, “Yes, it’s traditional. And if you ask me should we stay in that elite company of having home whites and road grays, I would say we should, but ….look at this (third) jersey. I see it and think, ‘We’ve got to wear that thing.’ ” And so they are, for their Sunday home games only. In a recent poll ranking all sports uniforms by ESPN.com, the Cardinals’ look placed third behind only the Montreal Canadiens (NHL) and Chicago Bears (NFL). The Cardinals’ birds-on-the-bat logo was noted as being “every bit as iconic” as the Yankees’ pinstripes. Hope that answers your question Michael, and thanks for sending your question over to HeyScan.com!